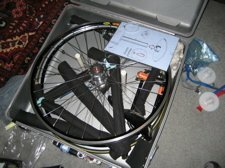 It’s late on Sunday night and I’m packing up my travel bike for a little trip to Florida and South Carolina. I’ll be flying with my custom steelSycip. I’ve had this one for a couple years and I’ve taken it around the world, literally. I can’t remember in how many cities I’ve been lost while riding this beautiful machine. 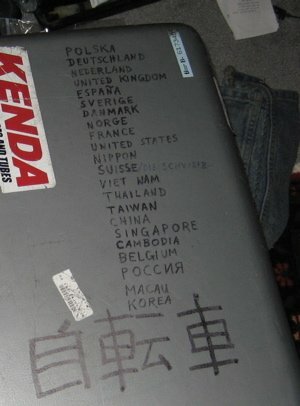 Taipei, London, Moscow, Lucerne, Paris, Oslo, Guteborg, Stockholm, Tokyo, Shanghai, Siem Reip, Hanoi…I’ve gotten around. The bike is mostly Columbus Zona with those awesome S & S couplings that allow you to split the frame in half and pack it in a airline friendly case. Jeremy Sycip was fantastic in working with me on the design. 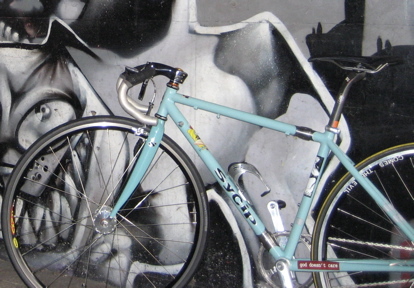 The bike can be raced legally on the track but it also has a derailleur hanger and cable stops to be run as a road bike. I usually travel with the bike set up as a streetlight drag racing fixie with a front brake, but the bike descends mountain passes with vigor in full roadie trim. Next weekend I’ll race it in some little time trial in Tampa, as a fixie with aerobars. Next Next post: Sitting in traffic, breathing dirty air . . .